He's ballooned across oceans, being knighted by the Queen and even owns his own islands. Meet the truly maverick British businessman: Richard Branson, the man who runs Virgin Group, a conglomerate of 400 companies. Let’s take a look at his life and passions as he turns 63. 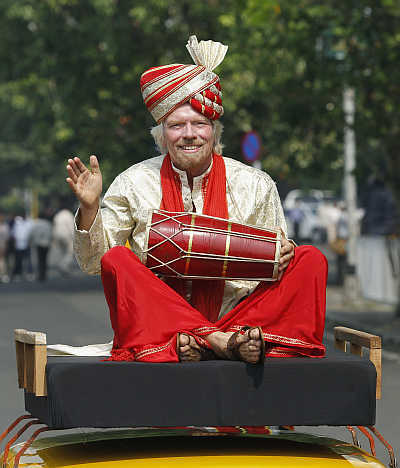 Image: Virgin Group founder Richard Branson plays a dhol while sitting atop a taxi during a promotional event in Mumbai. He was born on July 18, 1950, in Surrey, England. 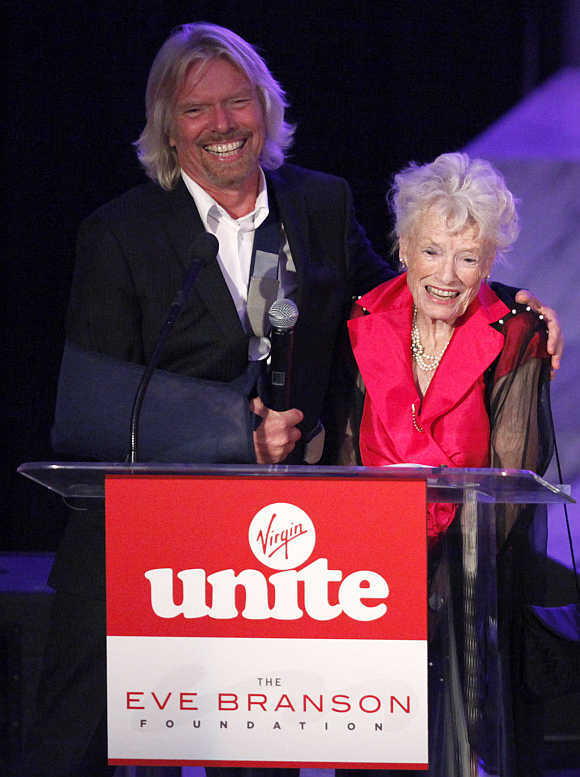 His father, Edward James Branson, was a barrister, while his mother, Eve Branson, was a flight attendant. 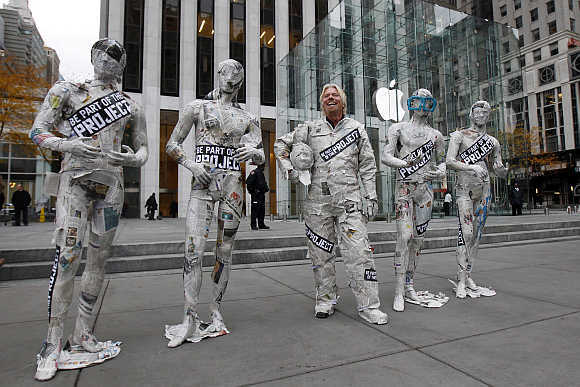 Image: Richard Branson, dressed in a newspaper suit, stands next to mannequins outside New York City's flagship Apple store. Born with dyslexia, school was a tough place for him and he finally gave it up in 1966 at 16 to launch a magazine, Student. He ran the magazine with the help of other students and the publication was able to generate $8,000 in advertisements in its first edition itself, not a mean feat by any standards. 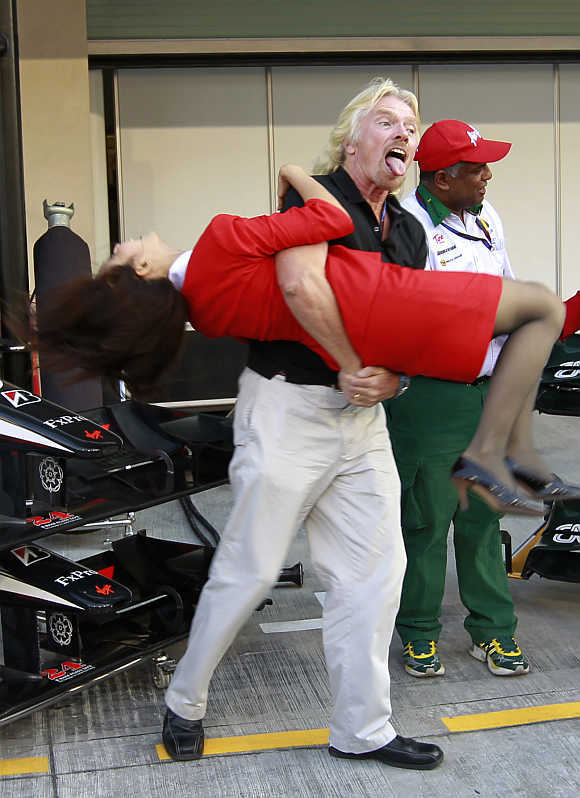 Image: Richard Branson carries a stewardess before the qualifying session for the Abu Dhabi F1 Grand Prix at Yas Marina circuit in Abu Dhabi. While living in a commune in 1969, where he was surrounded by music and drugs, he decided to launch a music company in an effort to fund his magazine. The music company was christened Virgin - and thus began the journey of one of the most famous brands in the world. 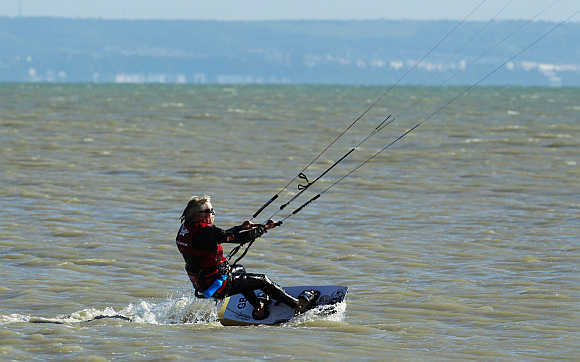 Image: Richard Branson kitesurfs to test conditions in the English Channel at Dungeness, in south east England. Although he wasn’t able to make big inroads with the music company, he was able to generate enough revenue to set up a record shop in London. Image: Richard Branson embraces his mother Eve Branson during a trip to the foothills of Morocco's Atlas Mountains. The record shop witnessed brisk business and the boy who left school at 16 was successful in constructing a record studio in 1972. 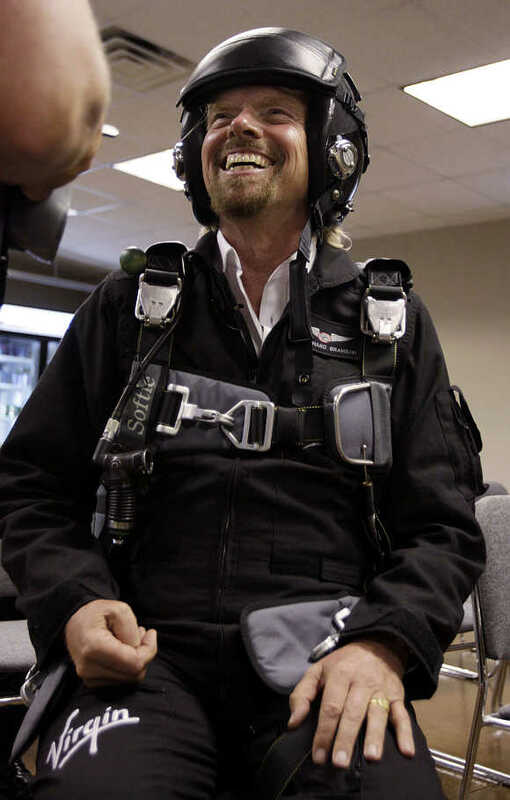 Image: Richard Branson shares a laugh during pre-flight training to fly on Virgin Mother Ship Eve, White Knight Two, at Wittman Field, site of the Experimental Aircraft Association Convention in Oshkosh, Wisconsin, United States. With another success in his kitty, he decided to launch a travel firm called Voyager, in 1980, an airline dubbed Virgin Atlantic, in 1984, and several outlets named Virgin Megastores. 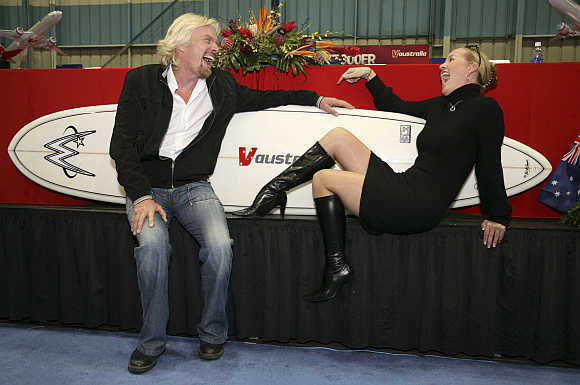 Image: Richard Branson shares a laugh with Virgin Blue Public Relation Manager Amanda Bolger in Seattle, Washington. All this wasn’t enough for him. So, he took to the airwaves and the world saw the birth of Virgin Radio and in 1993 and another record company in 1996. The second record company, V2, now has several big names in its bag. Image: Richard Branson and his daughter Holly sail on the boat 'Virgin Money', as it goes out for a sea trial in New York harbor near the Statue of Liberty. Richard Branson's Virgin Group operated more than 400 companies in nations spread all across, including the United Kingdom, the United States, Australia, Canada, Asia, Europe and South Africa. His business now also includes a train company, a luxury game preserve, a mobile phone company and a space-tourism company, Virgin Galactic. 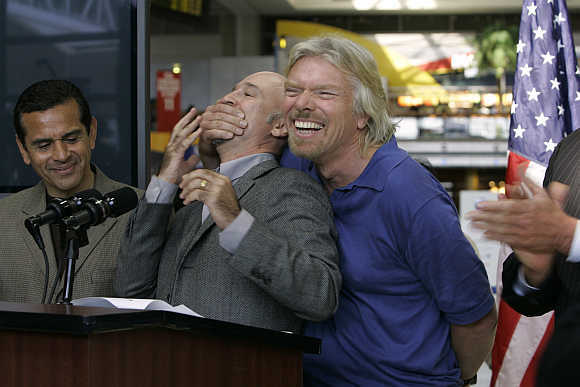 Image: Richard Branson covers the mouth of Virgin Blue Group Co-Founder and Chief Executive Officer Brett Godfrey during a news conference with Los Angeles Mayor Antonio Villaraigosa in Los Angeles, California. He is not only admired and loved for his business sense, but also for his love of adventure. He has broken the record of Atlantic crossing in Virgin Atlantic Challenger II in 1986, and the first crossing by hot-air balloon of the Atlantic (1987) and Pacific (1991). 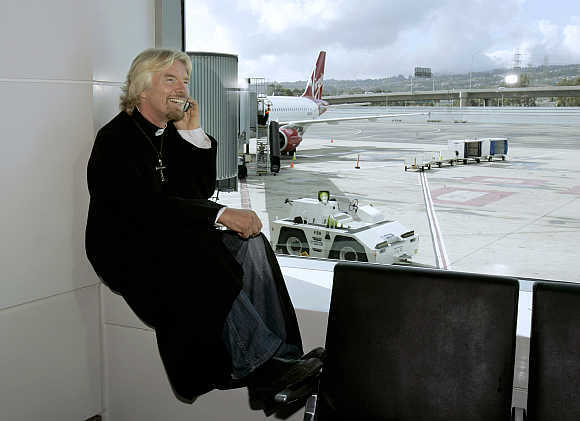 Image: Richard Branson waits to board a flight aboard his airline in San Francisco, California. The crowning moment for Branson came when he was knighted by the Queen in 1999 for his contribution to entrepreneurship. He is the fourth richest citizen of the United Kingdom, with an estimated net worth of $4.6 billion, and owns two island. 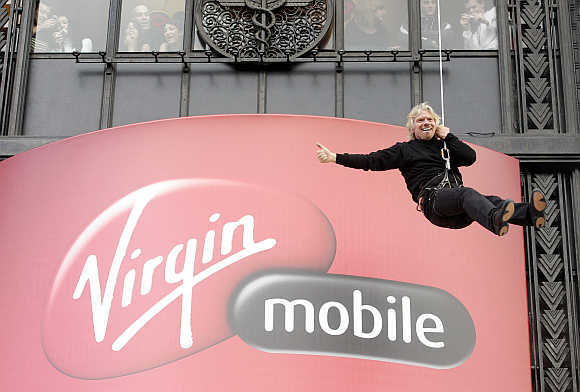 Image: Richard Branson descends the facade of the Virgin Megastore building on Paris' Champs Elysees on a rope as he promotes his mobile phone service in France. He is married to his second wife, Joan Templeman, with whom he has two children: Holly and Sam. Branson lives in London, England. 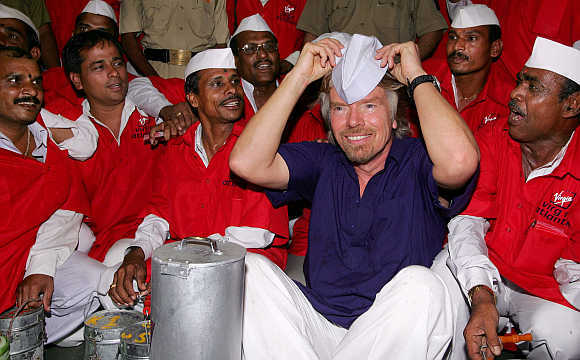 Image: Richard Branson wears a cap as he sits amid lunch couriers, known as 'dabbawallas', at a railway station in Mumbai. PHOTOS: Richard Branson's flying submarine!